These are products that we have purchased ourselves or were provided to us by the manufacturer or a distributor. We use, or have used, each one and here are our straight forward opinions on the products. 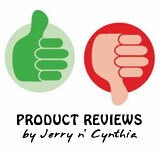 If you would like us to review your product, feel free to contact us via email.